Blue representing an Obelisk I envisioned in meditation. Red representing an Obelisk I envisioned in meditation. Since the birth of this Sigil, I have had 3 people whom have never met me in person but felt the call to have this sigil tattooed upon their body. When I say a calling it is an urge of Inspiration and only guided to those that truly feel that call. Below is a testimonial of what one of them stated. I would like to go over what exactly is a tattoo and it's purpose. In ancient tribes a tattoo would be placed on the body and it was said to give them strength in certain areas before battle or before a task. When broke down the in the belief of such why is this I thought? Upon realizing that based on Dr. Masaru Emoto's findings that we have the ability to program water by intention, words, sound and thought. You can then take this principle that we are essentially water beings and the water within our bodies can be programmed through affirmations, which has been proven. As such our body is simply a vessel for the water in which we carry, with this in mind we can quickly realize that tattoo's are merely a label upon a container which holds specific intentions and vibration. Reflect on the tattoo's you have on your body, remember why it was you even got it in the first place, what emotion, or what intention was it for when you received it. This is now what has been hard coded to your Water Crystalline Body. With this in mind, you can always shift the intention by now taking note of what the previous intention was and replacing it with something new. I have this same tattoo on my back, however without the circle or the triangle. Because my field, aura, orbital energy is the circle. My triangle is the transciver of my own mind. It was only until I tattooed this sigil on my body that I had received it's name. I was in a deep state of meditation and a the above sigil was revealed to me. This is the same logo on the website. It started with just the Y and the Spiral line going up. When I first received this sigil I thought it was just a random thing I made up. But as I would begin to practice Reiki 2 on some clients or be in meditations. This sigil would keep popping up within the darkness behind the eyes. As I began to use this sigil every time it would come into my mind as it was thoughtless. It would let me know which chakra points to use it on and did not tell me it's name at first. So I would keep using it until one day I was in a meditation and It spoke to me and told me it's purpose was to assist in supporting the story of remembrance of who we really are. After this point I would continue to use it on different points on the body and I would get alot of good feed back from the people I would use it on. Then a new transmission came in to let me know one of the many meanings was when two become one, or when one become two. The Spiral coming up was a representation of the kundalini rising. I began to see if I could find any information on this sigil because I had never seen it nor at this time did I even know what a sigil was and I even went to other readers or psychics to see if they have seen this sigil. I went on many forums posting if anyone had seen it before and I was not answered by to many people. I realized that I would have to wait for it to reveal to me what the actual meanings of the sigil represented. Later it was revealed to me: It is also a representation of the Rod of Asclepius. See here for More information: https://en.wikipedia.org/wiki/Rod_of_Asclepius. A short while after I received the name to be that of " Cho Go Pal ". Said very quickly. But only when it was transmitted to be tattooed on my body. The next set of information I received was the use of the triangle and the circle. The colors were chosen because in a past vision I had a deep meditation. I clearly saw 3 obelisk shaped crystals. One Blue, One Red, One Green. When I asked what colors it wanted the overall sigil it sent me that image of the meditation. 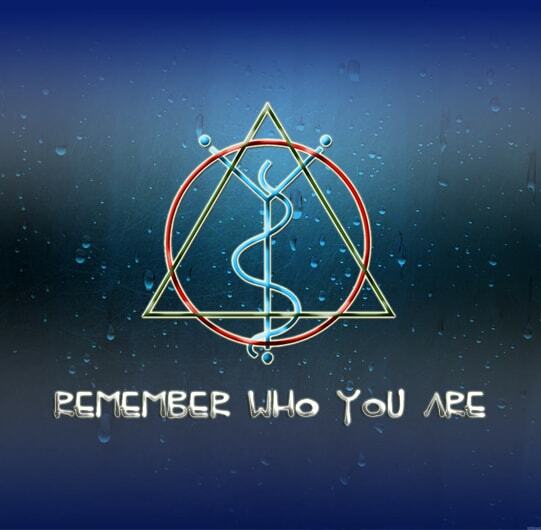 I got this sigil tattooed on my back because for me It was a strong calling from within telling me to do so. I just listened and allowed it to be done. When I was in the middle of the session of tattooing. 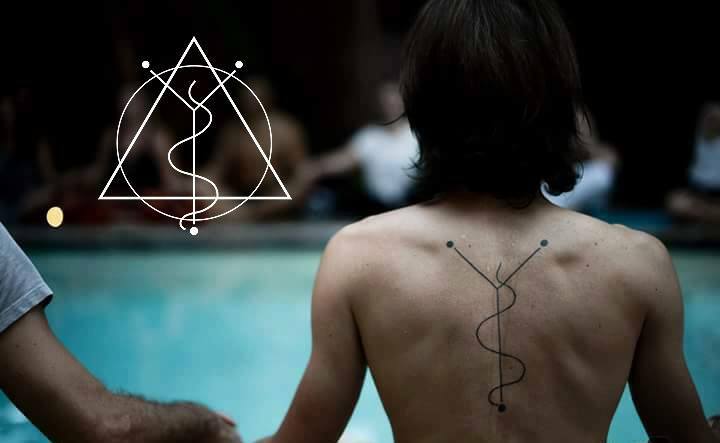 I received another piece of information that when a sigil is placed on the body just like a tattoo it would amplify the waters within our own bodies. Just like that of Dr Masaru Emotos label on a glass container. Our bodies are the container for the water inside of us. So by having it tattooed on my body I was programming my own water with intention. The intention to remember who I was before I chose this physical body. So by using this sigil on water or objects or a person during a energy healing you are changing the vibration of that object or space. To that of a remembrance frequency, one where we can begin to shed our layers of long told stories that we have been repeating for 1,000's of years. This sigil has then asked me to attune as many as who would received it so the story of remembrance of how powerful we truly are can come to be. Book a session with me and I will attune you so you can begin to share it with others. Session is only 15 minutes or so to receive this attunement. I was asked to never charge for this attunement. If I do not contact you please give me a call at 786-325-5362 at times i do not see the notifications for email.